You know, I haven’t seen too many paleo peeps attempting to recreate a caesar salad. I think caesar salads are probably one of the most “menu-ed” items out in restaurant land. I feel like everyone loves them and a lot of people order them on a regular basis. Heck, I remember in high school, we had caesar salad wraps that were hugely popular. I think all the girls bought them because they thought they were making a great “skinny” choice by eating a “salad” instead of a bean burrito; Little did we know that the wrap tortilla was a gigantic grain-fest and the dressing was chock full of industrial oils and milk powder. Blegh. Gross. Annoying: Spell check keeps making me capitalize Caesar. Here’s a little tidbit of trivia for the week. The linkage between Caesar (as in Julius) and his namesake salad is NOTHING. That’s right. This salad has no roman origin. In fact, its beginnings were close to paleo aside from the croutons. The original recipe from Tijuana (it’s a Mexican salad!) calls for romaine, parmesan cheese, croutons, eggs, garlic, olive oil, and worcestershire sauce. Nowadays, most recipes call for anchovy instead of W.sauce. Which, in my opinion, is WAY better. W.sauce has HFCS and as they say south of the border, that’s “no bueno”. This recipe is a bit more of a twist on the typical restaurant caesar. It can be used as a side dish or dress it up with chicken and avocado for a hearty meal! Remove and let cool. Pour bacon fat into a blender. Chop broccoli into small pieces and put in a bowl with the cheese and green onion. 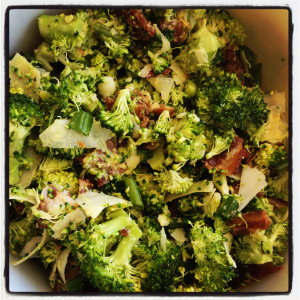 Once bacon in cool, chop and add to the broccoli bowl. Add yolk, garlic pow, black pepper, salt, and anchovy to the blender and mix until smooth. 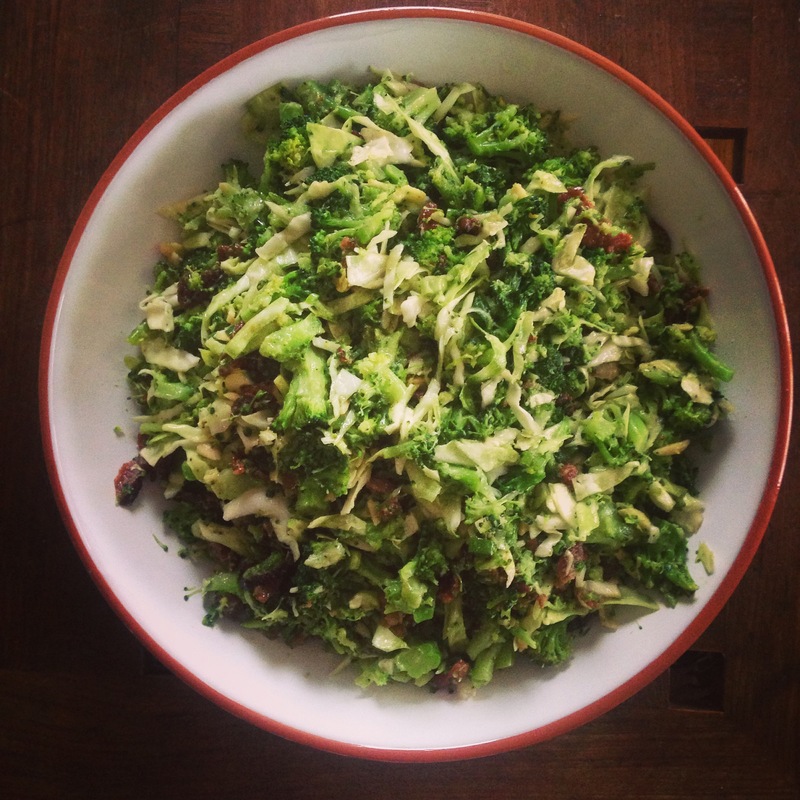 Pour over broccoli mixture and serve immediately. If you refrigerate it, heat the salad to melt the dressing as it will stiffen when cold. Serve as a side dish or as a main dish tossed with chopped chicken and avocado.